It’s important to us – and to you – that we only fit top-notch components to bikes we service. We’re proud to be associated with the following companies, and many others. 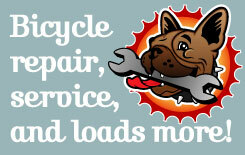 We're also please to be part of the Cycle Tech network of mobile bike mechanics. Exciting news for 2011 is our appointment as a dealer for Argon 18 frames. Read more on our dedicated website here.